As you can see in the diagram, SP1 and SP2 are providing CsC service to SP2000. BB_CE2 and BB_CE3 are actually a single BB router with 2 different vrf. The problem there was CE3 and CE4 can see each other loopback address but, you just cannot ping each other. I did troubleshooting like hell but, never expected the BB router. Later i found out that BB router is not forwarding the packets. I wondered why and went and took into BB router. Then, i noticed that routing table for BB_CE2 didin't have routes from CE4 and routing table for BB_CE3 didn't have routes CE3. Damn.. what would cause the BB router not to have the routes from other side of the MPLS clould while CE routers have the routes. 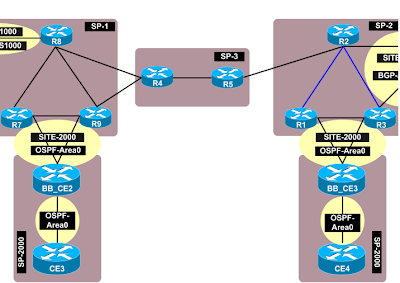 I though the routes were pass to CE routers by BB_CE2 and BB_CE3 ospf routing processes. Later i figured that BB ospf routing processes were not putting in the routes came from PE routers with down-bit into routing tables but passing them to CE routers which cause the CE routers to see each other routes. There is one command to fix this problem. I beleive most of you have already known the command. For those who haven't, the command is here. But, it doesn't explain why the router didn't install the routes into routing table and why you need to use it. Details can be found in "MPLS and VPN Architures Volume II"